They can grow up to 40cm, though 25-30cm is more common. No, they never leave the water and sit on land unless they undergo metamorphosis and become "adults". 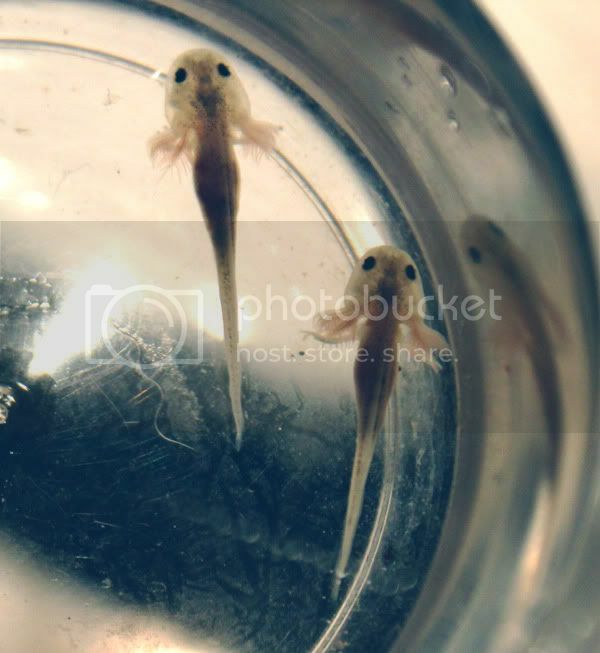 They are neotenic salamanders, which means that they have evolved to be able to stay permanently in their larval stage, and even breed like that. It is only under abnormal conditions that they will change - usually caused by low water level or poor water quality in the aquarium, and this change is very stressful for them and could even kill them. OR you could just put some Iodine into the water which doesn't harm them and has a 70% success rate. It shouldn't be all that hard to get a hold (Maybe pharmaies will have it?). If they do metamorphose, then their setup will be a little easier to manage as you can then add some dry land sections to it and less water. I think every effort should be made to breed them as they are critically endangered in the wild. Firefly - regardless of the method used, the process of metamorphosing is what is stressful to them, as they are not evolved to do it. And I think their setup is much easier to manage if it is 100% water. That means you don't have to maintain quality of the water as well as making sure the land areas stay clean and in order. The bigger they get the more interesting they become. And the deeper you go into the keeping of them the more amazed you become. 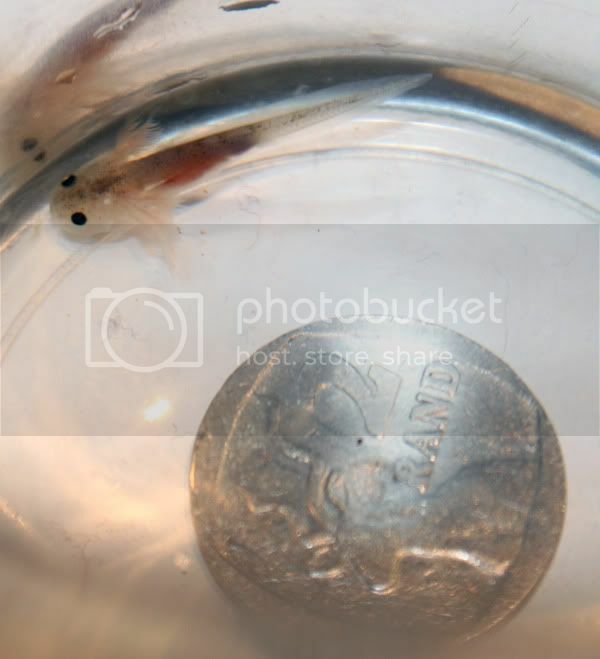 With regards to food you can get live or frozen at almost any pet shop or fish shop, more at a fish shop. You can also feed them pellets that you would feed Koi, earth worms and the list goes on. If you can't get live prey, you can buy brine shrimp eggs and grow your own food. They not hard to look after, just have to keep there tank and water clean. So a water change every week or every 2nd week. They don't have to be heated as they do not like warm or hot water. They do eat a lot and the bigger they get the more they eat, so eventually you will need to grow your own Feeders or find a store that will sell bulk feeders to you, cause more than one mouth will eat you out of house and home. So very cute. It's quite amazing how nature develops. I see you have them in a sort of fish bowl. Do you also need a filter and pump like you do for tropical fish? I'm finding the subject so interesting. Keep the photos coming. They seem to be growing in leaps and bounds. Am dying to see more. Marion - It is indeed amazing! I have them separated into little plastic containers to minimise the chances of cannibalism. There are three tubs with a total of 8 axos in them. I change the water 90% every day with pre-prepared water that has correct pH and kH, and is at the correct temperature. When they get bigger I will put them into filtered tanks. Awesome, I've always loved these, although never really made an effort to find them. The metamorphoses just adds to their appeal. Do you know whether they were bred locally? Wow! They have grown so much! There is a good couple of them that have been breed locally. Yes, they are bred locally, as they breed very readily in captivity. Mine certainly were. Here are some pictures of them at 7 weeks. They are really coming into their own now. Easily identifiable and looking more like the adults that they will become. Beautiful. AT 8 weeks, some of them have almost fully developed hind limbs already They really are starting to look like mini adults now! I'll update with more pictures soon.